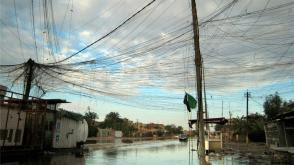 In Iraq, four people were killed by floods, which were caused by the heaviest rainfall in the capital Baghdad in 30 years. The downpours collapsed ramshackle houses. A woman and three children lost their lives. The wife was an aunt of the children. Both parents were injured. The victims come from a town 40 kilometers from Baghdad. At least five others were injured because their mud houses collapsed in a slum in Baghdad. Many streets are flooded. The infrastructure has suffered greatly from the war in Iraq and a lack of investment. Baghdad residents complain about bad roads and poor drainage, projects to improve infrastructure, beaches often by corruption. The government has for the fourth time this year a national emergency declared free day.